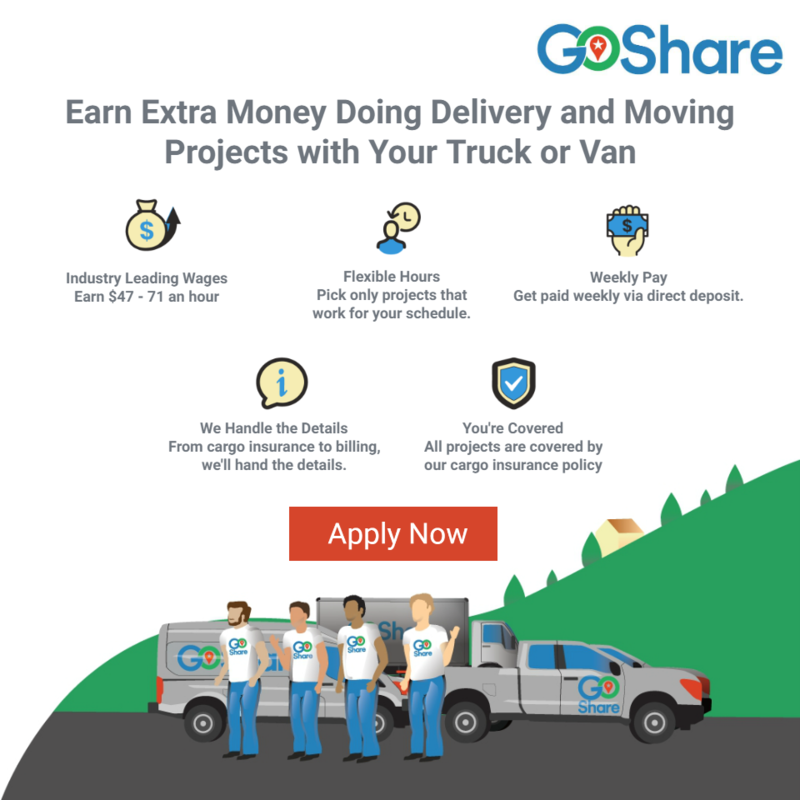 GoShare is hiring drivers who have cargo vans, pickup trucks, and box trucks! Be your own boss, work when you want, and get paid weekly! Our drivers earn between $47.52 - $71.52 per hour depending on their vehicle size. Use your truck or van and earn money by helping people move, haul, and deliver items in your community. You will need to be able to help load and unload. Turn your vehicle from a liability that is costing you money every month into an asset that is earning you money every month. You will enjoy the freedom to work when you want and meet some cool people along the way! GoShare Service Areas Include: San Francisco, Oakland, Concord, Daly City, San Rafael, San Jose, Fremont, Richmond, San Mateo, Novato, Sunnyvale, Hayward, Antioch, Redwood City, Santa Clara, Berkeley, San Ramon, South San Francisco, Mountain View, San Leandro, Walnut Creek, Milpitas, Livermore, Pittsburg, Palo Alto, Alameda, Brentwood, Cupertino, Pleasanton, Union City, Dublin, and more! Additional Services: Appliance Recycling, Junk Removal, Furniture Removal, Furniture Delivery, Movers, Mover, Garbage Disposal, Hauling, Moving, Delivery, TV Disposal, Donate Furniture, Local Delivery Service, Van Courier, Lowes Truck Rental, Courier Service, Uber for trucks, Uber for moving, Lyft for delivery, Truck Driver. Driving Jobs, Driver Jobs, Courier Jobs, Hot Shot Jobs, Part Time Job, Full Time Job, Independent Contractor Jobs.